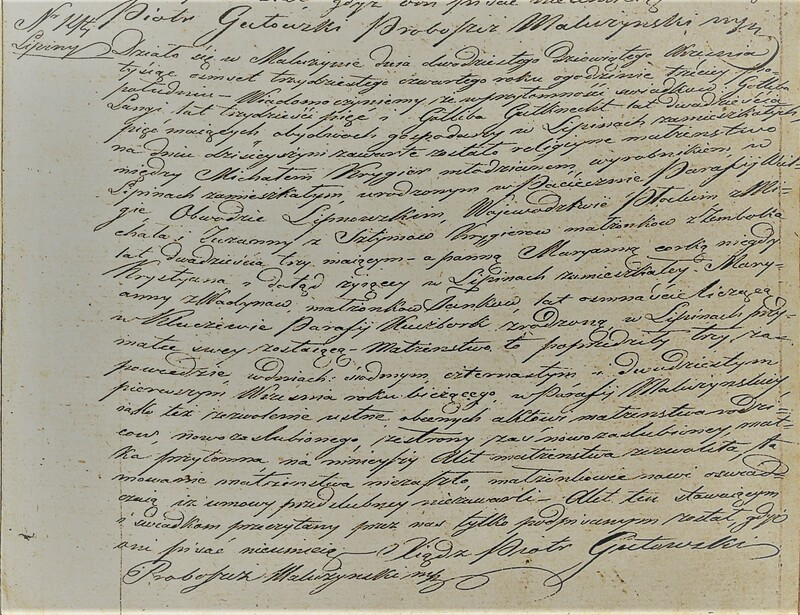 This is the 1836 marriage record of my great-great-grandparents, Jakub Niemiec and Agnieszka Kuczek. Unless I am mistaken, the passage underneath the couple's names (beginning "Jako nazwiarzhi...") is written in Polish. Can you help? I allowed to a minor Jakub for the marital relationship and marriage: Marcin Niemiec. Marcin's guardian. I signed for those who can not write: Stanisław Frączkowski. Would you be able to assist me with the translation details of the attached death record? It happened in the city Radziejów on the 1st day of May 1846 at 9 a.m. 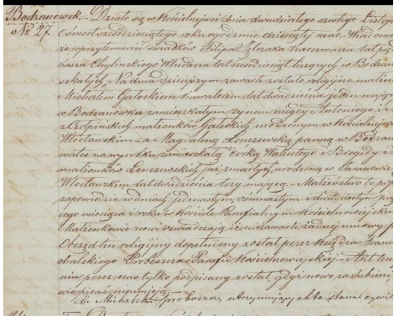 Appeared Franciszek Szwejkowski, notary, 47 years old and Maksymilian Bołkowski, pharmacist, 28 years old, both living in the city Radziejów and they informed that on the 28th day of April of the current year at 8 p.m. died nobleman Franciszka Giedwiłło nee Dąbrowska, 25 years old. The cause of death was enteritis. 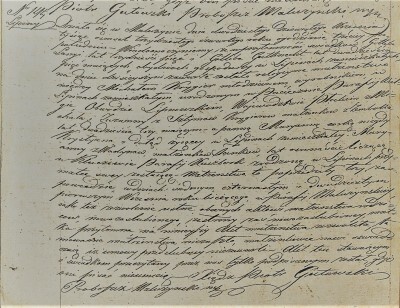 Daughter of Ignacy and Salomea nee Wolska, born in the city Radziejów, she left her widowed husband nobleman Felicjan Giedwiłło, military staff medicine doctor and lef her son Ludgier. After eye belief about Franciszka Giedwiłło death this was read aloud to the declarants and signed by them and us. I have a 1834 marriage record, which I believe belongs to my ancestors. The couples names which should appear would be Michal Kryger (Krüger) and Marie (Maryanna) Tank(e). I would appreciate a translation of the record. 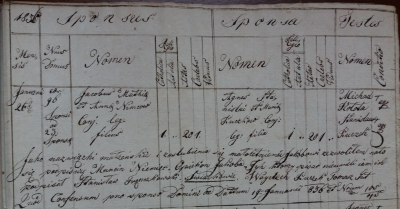 My family found two death records in Klejwy for Dominik (1815) and Krystyna Sidor (1829). We are trying to get the relevant data to fill in the chronology, such as ages, death info, villages, and family references. Thanks to anybody who might be able to help. 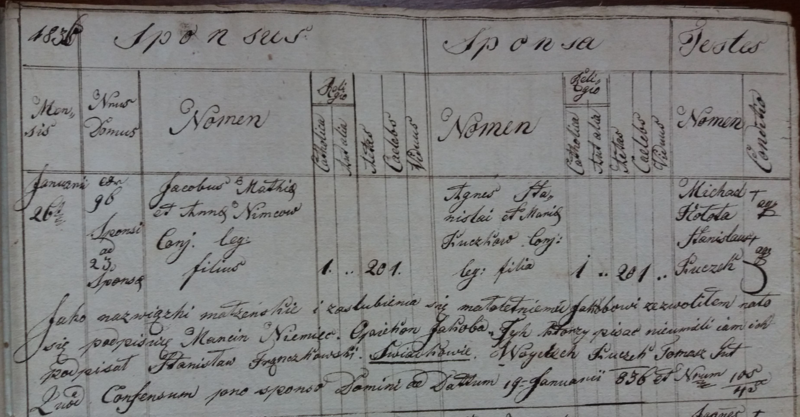 I was hoping you could translate this marriage record, Index #27. It is of my great great grandfather. His name is Michal Galecki. He married Magdelena Lenczewska. I don't understand if Magdlena is from Bodzanow or from Bodzanowek in Koscielna Wies parish. Marianna Tank, a miss, daughter of late Krystian and living in Lipiny Marianna nee Wadyn, spouses Tank, 18 years old, born in Kluczewo in Kuczbork parish, living in Lipiny with her mother. 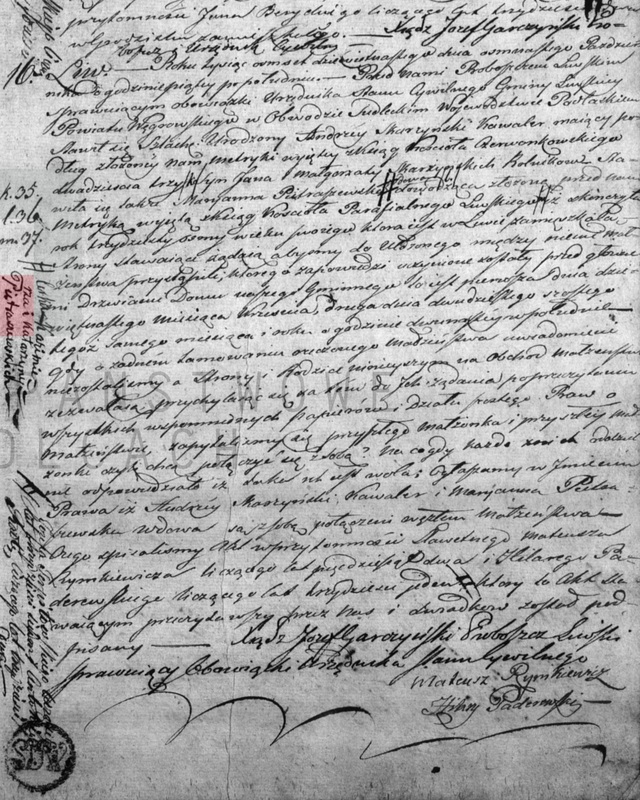 This marriage was preceded by 3 banns on : 7, 14 and 21 September of he current year announced in Malużyn and parish church. Groom's parents and bride's mother present during writing this marriage act gave oral permission for this marriage. There were no obstacles for this marriage. Newlyweds informed they didnt make any premarital agreement. This act was read aloud to the newlyweds and witnesses, all illiterate and signed only by us. priest Piotr Gutowski, Malużyn parish parson. It happened on the 9th day of January 1815 at 3 p.m. In front of Us, Sejny parish vicar, civil Registrar for Sejny community, Łomża Department, Sejny County and City appeared: Wawrzyniec Sidor, 23 years old and Szymon Sidor, 50 years old, both from the village Klejwy, living on the farm, deceased's sons and they informed that on the 8th day of the current month and year at 8 p.m. died in Klejwy in the house number 3 Dominik Sidor, peasant, 80 years old, living with his mentioned above children. He left his wife Krystyna nee Polania. We read aloud this act and signed it. Declarants are illiterate. priest Hipolit Charmałłowicz, Civil Registrar. It happened in the city Sejny on the 23rd day of July 1829 at 2 p.m. Appeared Jan Kwiatkowski, farmer, 60 years old and Franciszek Matulewicz, farmer, 61 years old, both neighbours living in Klejwy and they informed that yesterday at 7 p.m. died Krystyna Sidor, widow, laborer, living in Klejwy, 64 years old. After eye belief about Her death this act was read aloud to the declarants and signed only by us because declarants are illiterate. Magdalena Lenczewska, a miss, living with her mother, laborer, in Bodzanówek, daughter of late spouses: Walenty Lenczewski and Brygida Lenczewska nee Wiśniewska, born in Jaranowo in Włocławek county, 23 years old. 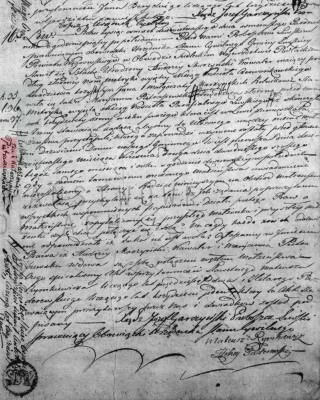 this marriage was preceded by 3 banns announced on: 11, 18 and 25 day of the current month and year in Kościelna Wieś parish church. Religious wedding ceremony was celebrated by the priest Franciszek Michalski, Kościelna Wieś parish. This act was read aloud and signed only by us because newlyweds and witnessed are illiterate. priest Michalski, parish parson, serving as civil registrar. 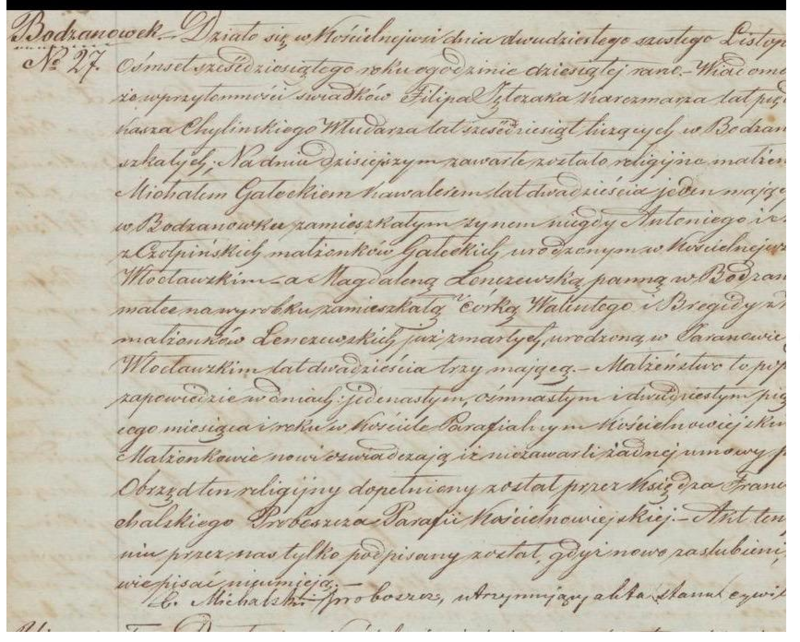 The wife part of this polish marriage record hard to understand, can someone help me to translate it? thank you so much for the translation, those are good news!! Thank you for the Sidor translations (Dominik and Krystyna)!